A trio of top Iowa Republicans are touting a series of state budget reforms. 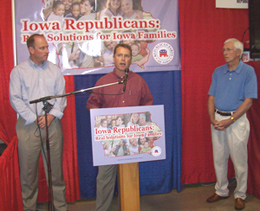 Matt Strawn, chairman of the Republican Party of Iowa, held a news conference at the Iowa State Fair to discuss the proposals. "We have a state budget that has increased by over 20 percent in just the last two and a half years," Strawn said. "We have seen Iowans burdened with a state debt that my two year old daughter is still going to be repaying after she graduates from college." The Republicans propose a constitutional amendment which would limit state spending to no more than 99 percent of state tax revenue. That restriction is currently state law, but Representative Scott Raecker, a Republican from Urbandale, accuses Democrats of repeatedly bypassing the law. "Iowans don’t spend more than they make in their own family," Raecker said, "and we should not spend more of their family than we receive at the state." The Republicans also advocate a change that would require a two-thirds vote of legislators in order to approve new state borrowing. Today, a simple majority is all that’s required. Republicans have been critical of Governor Chet Culver, a Democrat, for pushing a more than $800 million borrowing program he has called a state-level economic stimulus package. Senator Steve Kettering, a Republican from Lake View, calls that a turning point. "This year’s college freshman will be almost 50 years old when that debt’s paid off and that’s just unconscionable," Kettering said. A spokesman for Governor Culver was not immediately available. Senate Democratic Leader Mike Gronstal of Council Bluffs issued a statement. "While Republican legislators were voting no, no, no to anything that would give Iowans hope in the midst of this national recession, Democrats in the Statehouse were leading this state by balancing the budget responsibly without raising taxes, keeping our commitments to Iowa schoolchildren, creating the 4th best business climate in the nation for businesses in 2009, and helping create thousands of jobs across Iowa by making Iowa a national leader in the production of wind energy and other renewable fuels," Gronstal said in a written statement. Click on the audio link below to listen to today’s news conference.